About 1872 the family moved from New York and settled South Creek, Beaufort County, North Carolina. when Luther was 27 years old. His father was one of the founders of the South Creek Baptist Church built in 1884 while married to Margaret Hill. Seven years after the death of his second wife his father married his 3rd wife Augusta Fowler (1848-1915). letter dated March 24, 1898. His price list No. 24, for example, issued for 1911 was released for circulation in January 1910. Tokens 1845-1860. First Edition. (Krausse, 1982). Treasury Notes,” The Numismatist, Vol. 7, No. 6, June (1894) and Vol. VIII, (1895) : 106; July 1896 ad with no coin. Locke Mason’s (1826-1901), Mason’s Monthly Illustrated Coin Collector’s Magazine, and Price Current, Vol. 1, No. 1, June (1884) : 13. [Fig. 3] Mason’s Monthly Illustrated Coin Collector’s Magazine, and Price Current, Vol. 1, No. 1, June (1884) : 13.
language calling it splintered. Vol. IV, No. 11, November (1870) : 173. Fig. Postal Card Circular announcing Ed Frossard's 104th Sale, postmarked November 25, 1890. He exhibited a complete series of C.S.A. notes, The Numismatist, Vol. 7, No. 9, September (1894) : 211. Fig. Luther Brown Tuthill correspondence to the Chapman Brothers postmarked February 7, 1896, South Creek, North Carolina. Courtesy Lupia Numismatic Library, Special Collection, The Chapman Family Correspondence Archive. Estimate $300-$400. The 1900 U. S. Census lists him working as a clerk in a general store. Historical Society, since he formerly lived there in Port Jefferson. including the Chapman brothers were swindled out of large sums of money by "Little Eddie". franked with Scott #307 A122, Daniel Webster, pale red brown, 10c. Courtesy Lupia Numismatic Library. At the ANA Convention at the World's Fair St. Louis, Missouri, October 15, 1904, Tuthill was elected to the Board of Directors. Confederate Treasury Notes. He published the death notice of Titcomb in Mehl’s Numismatic Monthly. 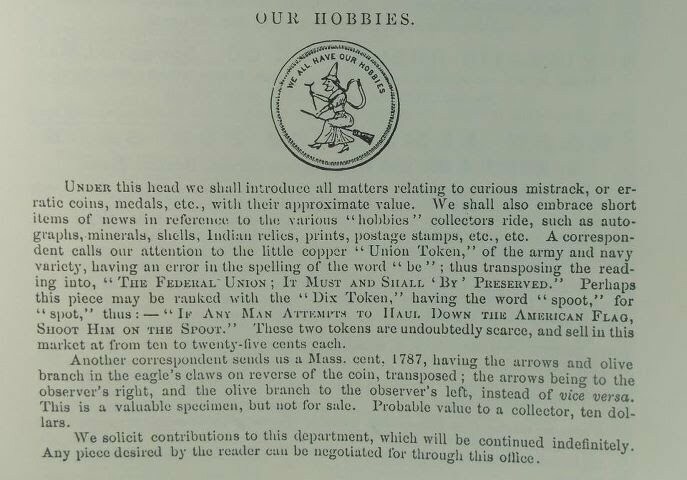 He also ran paid advertisements in the The Numismatist Vol. XIX, No. 1, (1906) : 32. His ad read as follows: “We All Have Our Hobbies. 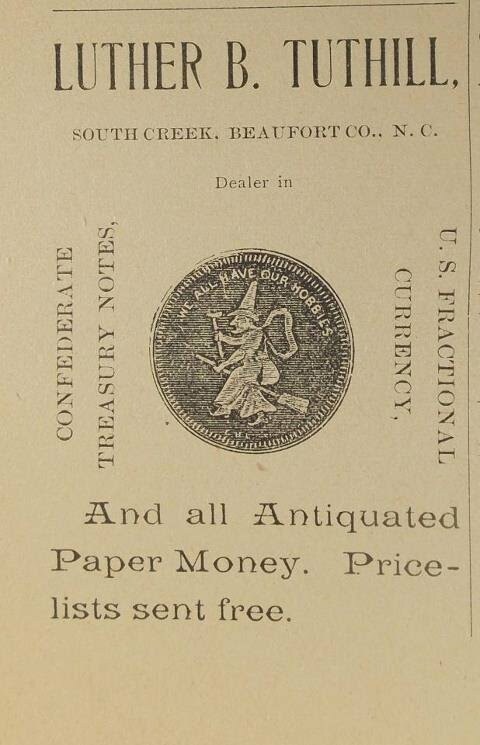 1906 issues (pages 219, 253) seeking to buy Confederate money. In 1924, he was given the commission of Postmaster, South Creek, North Carolina. was survived by his brother Gilbert Wilson Tuthill (1864-1933) [d. in Philadelphia, PA], and James Elbert Tuthill (1872-1952) [d. Norfolk, VA]. The Numismatist, Vol. 7, No. 2, February (1894) : ad in end papers. The Numismatist, Vol. 8, No. 1, January (1895) : 26; The Numismatist, Vol. 8, No. 1, January (1895) :  column two top display ad. Mehl’s Numismatic Monthly, Volume 4, Number 1, January (1911) : back cover ad.